Seven Pines National Cemetery, in Sandston, Virginia, was established in June 1866 for the reinterment of Union casualties from the Battle of Fair Oaks Station, also known as the Battle of Seven Pines. Located approximately eight miles east of Richmond, the cemetery retains its superintendent’s lodge from 1874 that U.S. Quartermaster General Montgomery C. Meigs designed, and is the final resting place for approximately 1,800 dead, more than 1,300 of whom were Civil War soldiers. In late spring of 1862, Union forces, led by Major General George B. McClellan, closed in on the Confederate capital of Richmond. On May 31, McClellan and his men reached a point called Seven Pines, located at the intersection of Nine Mile Road and Williamsburg Road, eight miles east of the city. Confederate General Joseph J. Johnston, charged with defending Richmond, struck preemptively, beginning a brutal fight. Due to confusion and miscommunication, nine of the 23 Confederate brigades in the area never participated in the battle. Although the result was ultimately inconclusive, each side suffered heavy casualties—nearly 6,200 for the South and over 5,000 for the North. After the battle, Confederate President Jefferson Davis put General Robert E. Lee in charge of the South’s forces. In June 1866, the Seven Pines National Cemetery opened to reinter Union soldiers who had died at the Battle of Fair Oaks Station, Savage’s Station, and other locations within the surrounding area. Of the more than 1,300 Union soldiers buried here, only 150 were identified; the rest remain unknown. The cemetery, which covers 1.9 acres, is enclosed by a four-foot tall brick wall. The main entrance, located in the center of the southern wall, is only accessible to pedestrians. A second pedestrian entrance and the only vehicular entrance are located at the southeast corner of the cemetery, near the superintendent’s lodge. At the center of the grounds are the flagpole and an artillery monument—an upright cannon with a cannonball set in the mouth of the barrel. Affixed to the cannon is an 1874 shield plaque with the cemetery's name, date of establishment, and the number of known and unknown interments. Seven Pines National Cemetery is located at 400 East Williamsburg Rd., in Sandston, VA. The cemetery is open for visitation daily from sunrise to sunset. No cemetery staff is present onsite. The administrative office is located at the Hampton National Cemetery, and the office is open Monday to Friday from 8:00am to 4:30pm, and is closed on all Federal holidays except for Memorial Day and Veterans Day. For more information, please contact the cemetery office at 757-723-7104, or see the Department of Veterans Affairs website. While visiting, please be mindful that our national cemeteries are hallowed ground. Be respectful to all of our nation’s fallen soldiers and their families. Additional cemetery policies may be posted on site. Richmond National Battlefield Park, a unit of the National Park Service, preserves several battlefields and historic sites related to the 1862 Peninsula Campaign and the 1864 Overland Campaign around the former Confederate capital. 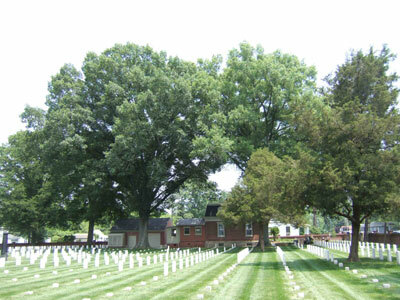 Seven Pines National Cemetery is one of seven national cemeteries in the Richmond area. The others include Fort Harrison, Glendale, and Richmond National Cemeteries in Richmond; City Point National Cemetery in Hopewell; Cold Harbor National Cemetery in Mechanicsville; and Poplar Grove National Cemetery in Petersburg. Seven Pines National Cemetery was photographed to the standards established by the National Park Service’s Historic American Landscapes Survey.